The thirteenth edition of LPM Live Performers Meeting begins on May 23, 2013 in Rome. LPM offers the unique opportunity to experience 4 days of audiovisual performances, VJing, workshops, panel discussion, product showcases presented by hundreds of VJs, audiovisual artists, new media professionals and thinkers from around the world. In fact it is this community of artists that made of the 2012 Rome edition a surprising event. We hosted more than 500 artists, 275 performances, workshops and showcases, recording an overall amount of 43 participant countries. Thanks to the contribution of the European Community, in 2012 the LPM project foresees a second foreign edition and, after the succesfull one in Xalapa made in 2008, this time the Meeting took place in Mexico City. Again, this XIII edition seeks to promote the practice of live video performance, thanks to a rich and unpredictable programme aimed at exploring different themes through new audiovisual languages, techniques and technologies. Vj, artists, designers, professionals and the general public will be involved in the manifold planned activities: from experimental audiovisual performances, architectural mapping shows, and DJVJ sets to workshops, roundtables, and presentations of products and hardware, with a special regard for Free and Open Source projects. Meeting areas devoted to the interaction among the hundreds of participants will be the corollary for the whole duration of the event. Live Cinema: works performed exclusively live, capable of demonstrating a narrative and experimental approach; projects in continual tension between perceptive experience and performative act. Video Mapping: a technique of video-projection that can animate architectural volumes. The effect is spectacular and exciting, it confuses and seduces our perceptions through the dialogue among images and tridimensional surfaces. Digital Freedoms: activism and beauty, aesthetic database, data visualization of public or private data; these forms of artistic expression have been able over time to both inform and activate the consciences of people around the world. Visual gender: thanks to the critical tension among gender studies, queer theory and contemporary art, the vision of the body, the sexual identity is disconnected from the stereotype of LGBT and video language becomes an instrument of emancipation of the genre. Generative Visual: thanks to an encoding of the active and reactive world around us new digital biospheres offer to the public the experience of complex networks composed of simple sensory-bit binary codes. Stereoscopic 3D: stereoscopic vision allows three-dimensional display of standard video content for a complete perceptive immersion. Ad hoc software and technologies are used to manipulate the visual perception of space to create “augmented” worlds. In addition, this year LPM hosts once again the VJTorna, an international VJing competition that offers to both the performers and the audience a unique and exciting experience. Three days of battles among VJs, an international jury of experts, four categories Pre-production, VJ Champion Battle Champion and Best Live VJ Mapper, an Audience Award and technical sponsors who put their products up for grabs. Born in Budapest in 2004, today the VJTorna is a fixed appointment for VJs worldwide. LPM is designed as a place of dialogue, comparison and exchange of ideas and information between artists and fans in the field that are accustomed to meet, communicate and interact mostly in the virtual space of the network. A real meeting place, a space that fulfills an important opportunity for dialogue and exchange, LPM encourages research, experimentation, the encounter between different forms of artistic expression, the interaction of multiple techniques and digital technologies, analog, software and hardware. 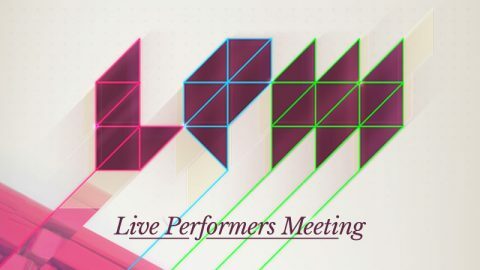 LPM is an unmissable spectacle during which the audience has the chance to meet the world’s largest selection of artists active in the field of live video performances. The Meeting aims to promote transnational movement and exchange of ideas, artworks and artists. All funds recovered by LPM are invested to support innovative research and experimentation in the field of live visuals with the latest technologies. LPM is part of AVNODE, whose objective is to improve and promote the veejaying culture worldwide. Realized in collaboration with international partners and co-organizers, the project includes a series of previews and promotional events focused on live video to be held in France, Hungary, Greece and Italy, during the most important European festivals and cultural events. LPM is produced and organized by Flyer Communication, Linux Club, FLxER.net, with the support of the Culture Programme of the European Community and Provincia di Roma.